There is a steady thud as the pears hit the ground. Unfortunately the local farmer is not making perry this year and when I tried to juice some with my cheap juice maker it was not successful. The background fabric is lightly dyed cotton/linen sheeting that I had rollered over with acrylic paint with threads wrapped around the roller. It was evocative of the gnarled trunk of the tree. I cut open a pear and printed the cut side on to the fabric, the central seed star clearly visible. 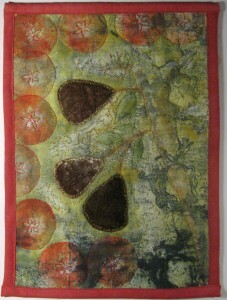 The three appliqued pears are cut from a crinkly velour. I coloured in the branches and leaves with intense pencil and water, adding colour to the trunk as well. I then used then added machine quilting which has given a slightly embossed feeling to the piece, though this is not conveyed very well in the photo. Finally, I enhanced some areas with white Markal painstick to give some light and shade.